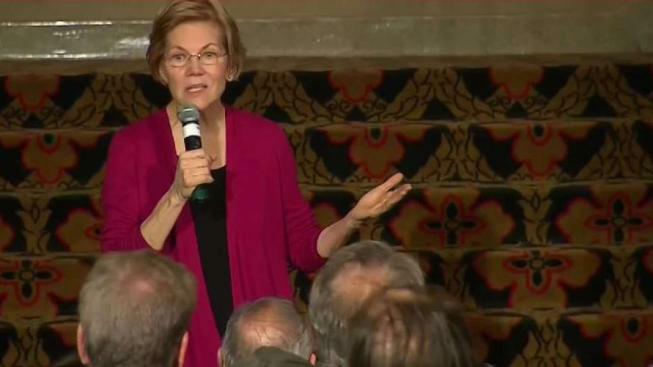 Sen. Elizabeth Warren's trip to Iowa over the weekend was nearly flawless and well-received, NBC News reported, no matter what questions the Massachusetts progressive may face over her electability. Warren was the first top Democrat to step toward the 2020 race for president and, in her three-day debut Iowa trip, nearly 3,000 people came out to hear her talk about selling Girl Scout cookies and fighting what she calles a rigged political system. "When I first heard her on the stump, it made me feel like exactly where I grew up and the difficulties I grew up with," said J.D. Scholten, a Democrat who lost a challenge against conservative Rep. Steve King, R-Iowa, in the midterms. But Warren's age, gender and politics will face scrutiny as she campaigns in what is expected to swell into a large field of Democratic hopefuls, and a woman in Sioux City asked pointedly about President Donald Trump's bullying over Warren's bungled rollout of a DNA test over the senator's Native American ancestry.